How does Plain Community Business Exchange promote your business? Our magazine brings your products to the mailboxes of thousands of potential customers who will never look at your website. We open a whole new world by networking you with plain community business owners who have chosen not to have modern technology, but look forward to sitting down with our paper to find the services they need. Business to business. These ads help you find products available for wholesale that you can use or sell in your business. Business to buyer. This section contains businesses that are selling their products directly to the customer. Classified ads. You can list products for sale under our Classified ads section. Machinery Trader. Sell the machines your business no longer needs, or find a new one in our Machinery Trader section. You can list machinery on separate lines along with a price and phone number. Monthly featured advertiser. We print these on request. 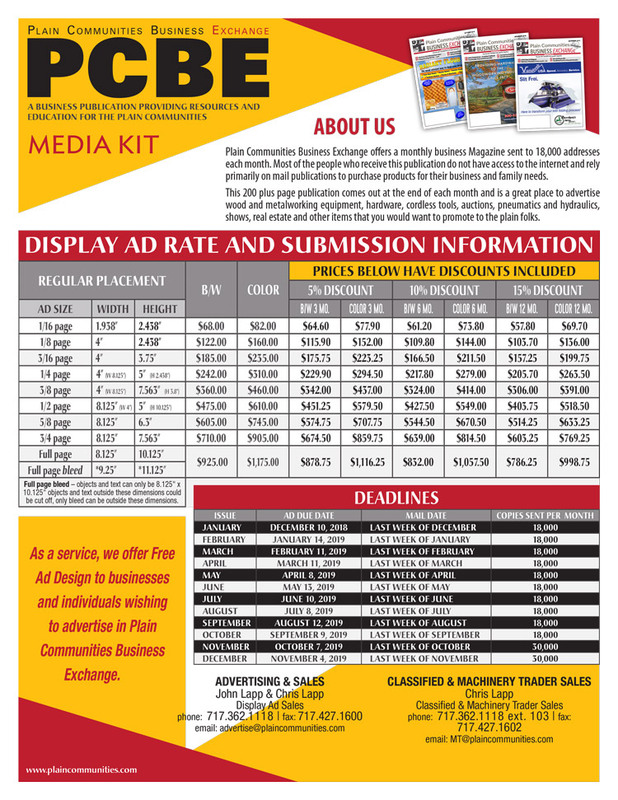 We offer a variety of ad sizes ranging from a full page to 1/16 of a page. You can choose to print the ad in color or black and white. We give a discount if your ad will be run for 3 months or more. Even if you decide to downsize the ad, you still receive the discount. Is it worth the money to advertise? Absolutely! Give us a call today at 717-362-1118 to discuss how we can best promote your business through our advertisements.